It’s time for some outrageous action, as entertainment editor John Turnbull checks out a couple of international action flicks — the hyper-kinetic Triple Threat and the innovatively violent The Night Comes for Us. Uwais returns for The Night Comes for Us, playing Arian, the manager of a Macau nightclub and former Triad enforcer. Searching for a quiet life, but unable to quell his violent tendencies (he beats a bunch of guys to death for hassling one of his waitresses), Arian is drawn back into the world of the Triads when his old friend Ito (Joe Taslim) goes rogue to try to save a young girl. Insanely violent, The Night Comes for Us is one of those movies that doesn’t really have any good guys. Iko is introduced leading a death squad killing an entire village over a Triad drug debt, who only shows a flash of conscience when he’s asked to kill a ten-year-old girl in cold blood. Instead, Iko turns his AK47 on his own men, massacring them all. Arian is slightly better from a moral standpoint, but is still willing to kill people at the drop of a hat and also seems to hold some questionable attitudes towards women. If you’re one those people who lament the fact American action movies aren’t as violent as they were in the 1980s, this is definitely the movie for you. If, on the other hand, you’re at all squeamish, then you’d better give this one a miss, as Tjahjanto is very inventive when it comes to thinking of new ways for people to kill one another. Directed by British stunt-coordinator Jesse V. Johnson, Triple Threat is a truly international movie. Co-produced by Thai, Chinese and American studios, the movie brings together the most prominent martial artists of Indonesia, China and Thailand, and pits them against two of the biggest American B-movie action stars working today. Telling the story of a billionaire heiress (Celina Jade) who is being hunted by a group of mercenaries, Triple Threat is packed with legitimate martial arts masters who also happen to be actors; Iko Uwais, Tony Jaa and Tiger Hu Chen are the good guys. On the other side are Scott Adkins, Michael Jai White and former UFC fighter Michael Bisping, along with a bunch of tough guys who are basically cannon fodder to be kicked and elbowed repeatedly by our heroes. In a fair world, Scott Adkins would be this generation’s Jean-Claude Van Damme — a genuine action star able to play both a sympathetic hero and a hissable villain. It is only a matter of time before Iko Uwais or Tony Jaa break big in the U.S., although Tiger Hu Chen may be in for a tougher time with his little-boy features and bowl haircut. Michael Jai White seems destined to play B-movie villains for the rest of his life, and unfortunately Michael Bisping has taken so much damage inside the octagon, his face is difficult to look at. Still, he throws a mean-looking left hook and takes a convincing beating from a guy half his size, so I guess that’s something. 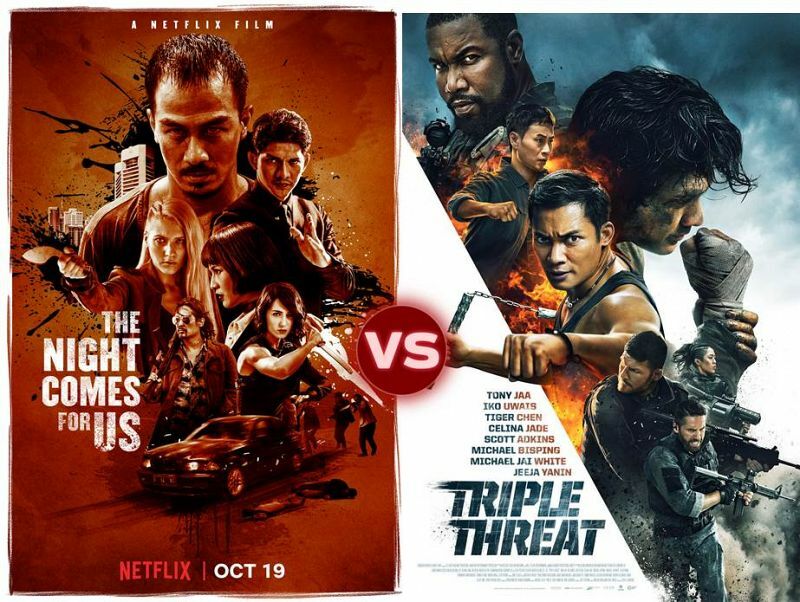 One common factor in both these movies is Indonesian superstar Iko Uwais, a genuinely charming actor with the ability to perform amazing physical feats. Unlike the odious Steven Seagal, Uwais is more than willing to take a punch, and his diminutive stature (particularly compared to Adkins or White) makes him a great underdog, despite his silat skills. The other significant feature that unites Triple Threat and The Night Comes for Us is the grungy set design, showing that there is nothing clean, nothing pure in these worlds. Shot in the back streets of Thailand, the jungles of Cambodia and the brothels of Macau, these movies could be viewed as a lamentation on the decline of modern society, or just an excuse to watch people beat each other up for a couple of hours.